Home › What is a BER? 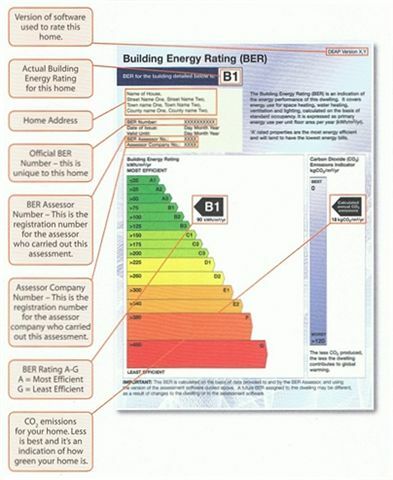 A Building Energy Rating (BER) calculates the energy performance and CO2 emissions of a building. On completion a certificate is issued which will rate the property from ‘A’ – ‘G’. The certificate is similar to those you may see on larger electrical items such as fridges and freezers (see sample BER Certificate opposite). Why do you need a BER? BERs are a requirement under the EU Energy Performance of Buildings Directive (EPBD). The principle behind this is that awareness is the key to improving energy performance of buildings. BERs must be carried out in an independent manner – an agent selling or letting your property cannot carry out a BER for you. When does a building need a BER? The BER certificate must be furnished to any person expressing an interest in purchasing or leasing the property. How long does a BER last? Provided there are no substantial changes to the property (eg an extension) then a BER is valid for 10 years. What happens if I don’t get a BER? A maximum fine of €5,000 can be levied by a district court for non compliance. Not sure if your property has a BER? Click here to check the national BER register. *Some minor exclusions do apply (eg places of worship or detached buildings under 50 sq mts). Feel free to contact us for more information.